They expect others to look out for them. They do not understand complicated traffic situations. They overestimate their knowledge and physical strength. They focus on one thing at a time. They assume that if they can see a car, the driver can see them. They think that cars can stop instantly. They have difficulty estimating the speed a car is traveling. They have a field of vision one third narrower than adults have. They have difficulty determining the direction of sounds. avoided. Some crashes, however, happen through no fault of the cyclist, and that is why children must be taught to ride defensively and to wear bicycle helmets. 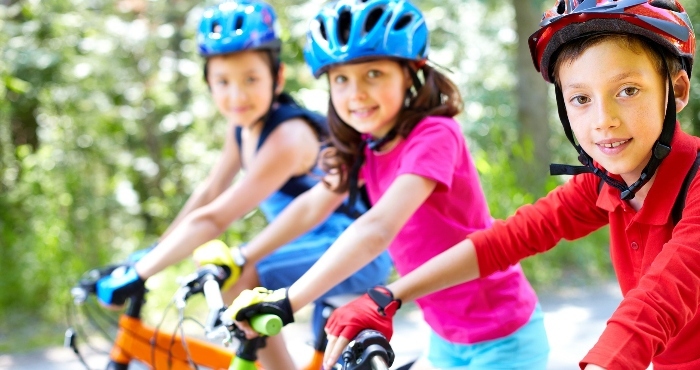 85% of all head or brain injuries could be avoided if cyclists wore bicycle helmets. 85% of all bicycle crashes occur within five blocks of home. 47% of all bicycle crashes occur off the road, in driveways, and on sidewalks. 90% of all accidental deaths to children on bicycles occur when they dart into traffic from a driveway or when they cycle through a stop sign. Traffic laws tell children what rules they must obey when cycling. Traffic laws alone, however, cannot protect them. To be safe they must develop cycling skills and good judgment. The 4-H project, Bicycle Adventures, teaches children how to ride bicycles skillfully and defensively. The project takes the cyclist through selection of a bike, care and repair, as well as personal safety while cycling. Adjust Your Bike to Fit.